Can you post a picture of how exactly it's broken? 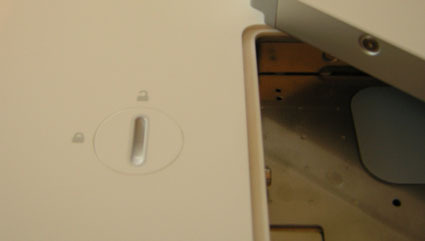 The battery lock mechanism is part of the MacBook bottom case and it can't be swapped. You need to replace the bottom case. Try to find a used bottom case in good condition. I've got a similar problem except the lock pinged off whilst in the locked position so I can't actually take the battery out!! To add insult to injury, this only happened when I was about to replace the battery which no longer charges! Is there a way of removing the bottom case without taking the battery out?